Yayoi Kusama: Narcissus Garden. The Glass House. Photo: © Lane Coder. The Glass House is pleased to present Yayoi Kusama: Narcissus Garden, a landscape installation that will be on view throughout the 2016 tour season to celebrate the 110th anniversary of Philip Johnson’s birth and the 10th anniversary of the opening of the Glass House site to the public. First created 50 years ago in 1966 for the 33rd Venice Biennale, this iteration of Narcissus Garden will be incorporated into the Glass House’s 49-acre landscape. “We are honored to be working with Yayoi Kusama, an artist Philip Johnson both admired and collected. This exhibition playfully engages the entire site, creating a celebratory mood for Philip Johnson’s 110th birthday and the 10th year since the opening of this museum,” said Irene Shum, Curator and Collections Manager at the Glass House. 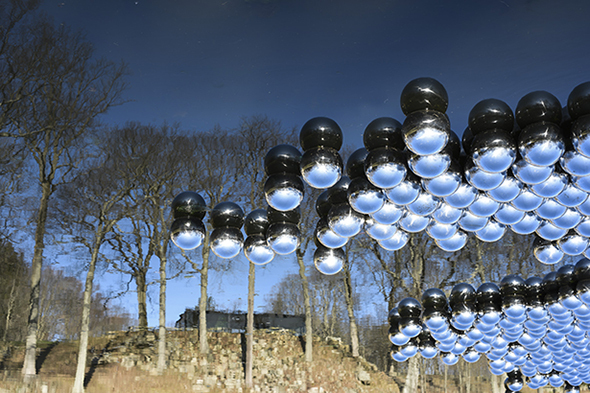 Narcissus Garden, comprising 1,300 floating steel spheres, each approximately 12 inches in diameter (30 cm), will be installed in the Lower Meadow and forest, creating a dramatic view to the west of the Glass House. Drifting in the newly restored pond, the spheres will move with the wind and follow the pond’s natural currents, forming a kinetic sculpture. Their mirrored surfaces will reflect the surrounding Pond Pavilion (1962), wooded landscape, and sky. The Glass House will also install Kusama’s recently created enormous steel PUMPKIN (2015). The placement of PUMPKIN will be on the hillside meadow, east-northeast of the Brick House (1949), on a concrete sculpture footing where Ellsworth Kelly’s Curve II (1973) was once installed. “The first time I saw a pumpkin was in a farm in elementary school. In Japanese, a ‘pumpkin head’ is an ignorant man or a pudgy woman, but for me, I am charmed by its shape, form, and lack of pretension.” Says the artist. As an exclusive opportunity and for a limited time, September 1 through 26, Kusama will create an “infinity room” with the Glass House itself covered with Kusama’s Infinity polka dots. Visitors who attend the exhibition during this period will be offered the unique experience to simultaneously see the world through the eyes of both Philip Johnson and Yayoi Kusama. Versions of the sculpture have been included in traveling museum solo exhibitions as well as important international group exhibitions, including the Asia Pacific Triennial of Contemporary Art at the Queensland Art Gallery, Gallery of Modern Art, Brisbane, Australia (2002); Whitney Biennial in Central Park, New York (2004); and Louvre’s Sculpture Programme for FIAC in the Jardin des Tuileries, Paris (2010); among others. The work has also been exhibited in institutions and historic residences, such as the Burle Marx Education and Cultural Center at the Instituto Inhotim, Minas Gerais, Brazil (2009) and the Chatsworth House, Derbyshire, England (2009). Organized by Irene Shum, Curator and Collections Manager at the Glass House. Special thanks to David Zwirner gallery and Ota Fine Arts. Funding for the dots installation and film program was provided by Joeb Moore & Partners Architects and Pettit Art Partners. Special exhibition tours will be offered throughout the season once a week. Visitors will access new areas of the property and have a closer experience to the artwork. Private tours with the curator, Irene Shum, will be available during the special dot installation September 1 through 26, 2016. Spring 2016 will offer a film workshop for the upcoming documentary Yayoi Kusama: A Life in Polka Dots, is currently in post-production and to be released in the fall 2016. Executive Producer Alice Koh and Submarine Entertainment‘s David Koh will lead the discussion and take questions from the audience. Fall 2016 will have a special performance by Ryuichi Sakamoto and Alva Noto, the composers of the original, Golden Globe-nominated, film score for the major motion picture The Revenant. Tickets start at 25 USD, including a tour of the site.